In the early 1900s, Des Moines was still a predominantly horse and buggy town. Several organizations, in an effort to ease the strain on horses, built two public water troughs and then gave them to the City of Des Moines. Over the years, the water troughs became obsolete as automobiles became the common mode of transportation. The original locations of the two water troughs were at 8th and Cherry and Penn and Grand, most likely in the middle of the intersections. Their original locations were selected with the approval of the National Humane Alliance and subsequently, was the reason they were moved. Apparently, they caused too much congestion when buses, trucks, and autos came along. The city council ordered their removal and for a while, they were stored. At some time after 1915, one was moved to SE 10th and Scott Avenue and the other moved to SE 6th and Hartford. 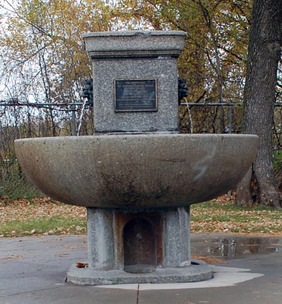 The Southeast Water Trough at Sam Cohen Park was placed on the National Register of Historic Places in 1976. Through the decades and even today, the trough is still dispensing water, albeit now as a fountain. Water pours from two lion heads into the horse trough. At the base, four smaller water-filled troughs allowed smaller animals to drink. Water also flowed from a small alcove above the horse trough.